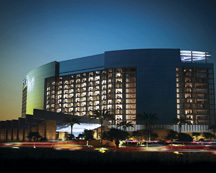 IndigoVision’s complete IP video solution has been chosen by the $1 billion M Resort, Spa and Casino. The newest Las Vegas casino resort resides on South Las Vegas Blvd. and will open in March 2009. M Resort is owned and operated by Anthony A. Marnell III. The system will provide CCTV surveillance for the property. IndigoVision has also been selected to provide a digital CCTV system for the Colorado Belle in Laughlin, Nevada, which is owned and operated by Marnell Sher Gaming, LLC. In excess of 900 cameras will be installed or upgraded in both casinos by IndigoVision’s approved partner, Southwest Surveillance Systems, in complete compliance with the local gaming board. The flexibility of IndigoVision’s IP video solution will specifically enable the Colorado Belle to remain fully operational while the upgrade from the analog/DVR system to the digital CCTV system takes place. The new system will allow the existing CCTV cameras at the property to be reused. Each camera will be connected to an IndigoVision transmitter/receiver module which converts the analog feed to DVD-quality, 4SIF, 30fps digital video for transmission over the IP network. This is achieved without any frames being dropped, whatever the level of motion and activity in the camera scene. This is a fundamental requirement of the gaming board and casino operator. Any dropped frames within a video clip could hide fraudulent or criminal activity and make any customer disputes more difficult to resolve. The M Resort will use IndigoVision’s latest 9000 product, which will be the first ever implementation of H.264 video compression in any casino worldwide. Operators in both casinos will use a total of nine CCTV workstations running ‘Control Center’, IndigoVision’s enterprise IP Video and alarm management software, to view and analyze live and recorded video from all of the cameras. ‘ Control Center’ is license-free software allowing the casino to deploy as many workstations as required for no more than the cost of the PCs. Recording will be achieved by using IndigoVision’s Windows NVR software running on PC servers. Eight NVRs will be used in both casinos with a total of 112 Terabytes of RAID redundant storage providing continuous recording at 4SIF, 30fps for 7 days. A hot spare NVR with 7 Terabytes of storage will be installed in each casino to provide a fully redundant recording solution. The combination of ‘Control Center’ and the IP network creates a ‘virtual matrix’ which, unlike its analog matrix equivalent, provides a totally flexible and scalable solution. Any camera can be viewed on any ‘Control Center’ workstation and additional cameras can easily be added to any point on the network when the system is expanded.